Data for Decisions aims to make better use of existing primary care data to improve knowledge, medical education, healthcare policy and the way medical care is delivered, and so ultimately improve the health of Australians. The ‘secondary’ use of de-identified medical records is widely recognised to have the potential to improve public health. Individual patient records are important to doctors and individuals, but when de-identified (to maintain anonymity and patient privacy) and combined with many thousands of other records, a powerful research tool is created with the potential to generate new knowledge to improve health care. 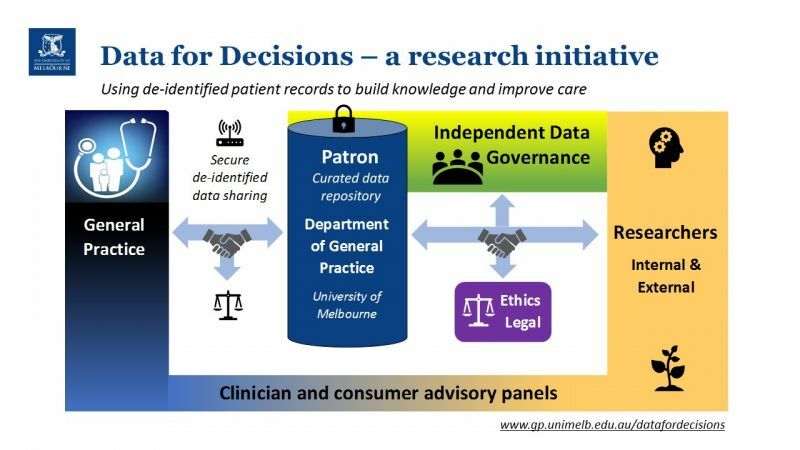 Data for Decisions, incorporating the Patron program of research, is a University of Melbourne research initiative undertaken through the University’s Department of General Practice. With the permission of general practices, we collect information from de-identified medical records and use it to increase knowledge and improve healthcare practices through research. The data is securely stored in a University managed primary-care data repository called Patron. The first practices consented to contribute to Data for Decisions in late 2017, but the program has been under development since 2016 ensuring that it builds on strong foundations of international best practice in data governance and management. More information about this research initiative can be found throughout this website and by downloading the Data for Decisions Program Protocol document. The diagram depicts the steps from extraction of de-identified data from general practices, to use of the data by researchers - including the ethics, governance, legal and advisory processes.